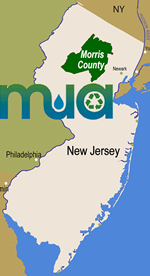 Welcome to the Morris County Municipal Utilities Authority's (MCMUA) website; MCMUA.com. The MCMUA Solid Waste Division implements recycling, solid and hazardous waste programs throughout Morris County. The MCMUA Water Division sells drinking water to several municipalities and water companies. The MCMUA is Morris County's environmental resource. Coordinating and running recycling programs throughout Morris County. Two transfer stations handle the disposal needs of Morris County. Managing household hazardous and eligible business waste. Water System Pumping water from deep underground aquifers to mostly municipal water systems. Water Quality Keeping our watershed clean - Read drinking water quality reports. Conservation Saving water because it is a valuable resource in so many ways. Education Resources to help learn about water and how to use it wisely. New - starting on March 12, 2012 - The MCMUA provides curbside recycling collection service for Mine Hill residents. Pickups will take place every other Monday in the entire town, starting Monday, March 12, 2012. Collection does not occur on major holidays. Starting March 12, 2012: For Mine Hill, the MCMUA collects single-stream mixed recyclables. This means that aluminum, glass bottles and jars, steel cans and plastic containers can be mixed with recyclable paper including newspaper, corrugated cardboard, junk mail, office paper, magazines, cartons, etc., for curbside collection. Additionally, none of the newspaper or cardboard needs to be bundled or tied. There is a 50-pound weight limit on the recycling container put out at curbside for collection by the MCMUA. Mine Hill also operates a municipal recycling depot where a limit number of specialized recyclables can be dropped off for recycling. Click here to read about Mine Hills municipal recycling depot. (Recycling - Single-Stream - All-In-One) Rinse thoroughly (no residue allowed) and commingle with recyclables. (Recycling - Single-Stream - All-In-One) Commingle with other recyclables. 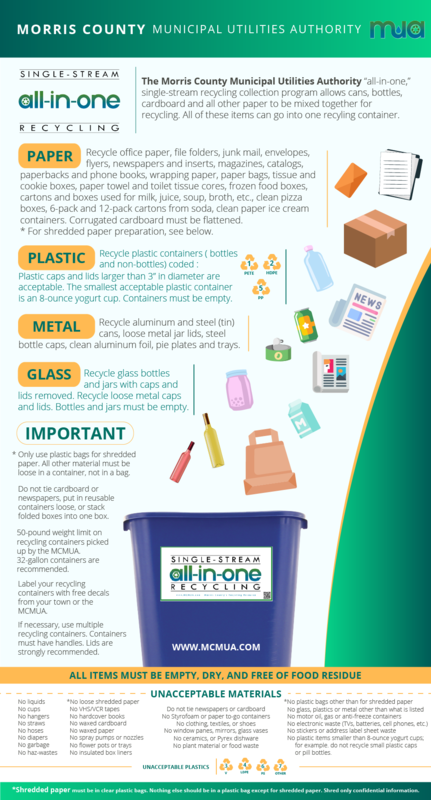 (Recycling - Single-Stream - All-In-One) Commingle with other recyclables. Flatten all boxes. Include beverage carriers, cereal, pasta and facial tissue boxes, paper towel rolls. (Recycling - Single-Stream - All-In-One) Flatten and mix with other recyclables, and do not bundle or tie. (Recycling - Single-Stream - All-In-One) Remove lids, rinse the glass and commingle with recyclables. Put metal lids into container; do not put metal lids back onto glass bottles and jars. (Recycling - Single-Stream - All-In-One) Mix with other recyclables. (Recycling - Single-Stream - All-In-One) Mix with other recyclables, and do not tie or bundle. (Recycling - Single-Stream - All-In-One) Empty, rinse and commingle with recyclable mix. Do not put caps/lids back onto bottles. Put caps/lids into the garbage. (Recycling - Single-Stream - All-In-One) Empty, rinse and commingle with recyclable mix. Do not put caps/lids back onto containers. Put caps/lids into the garbage. (Recycling - Single-Stream - All-In-One) Empty and mix with other recyclables. (Recycling - Single-Stream - All-In-One) If recycling shredded paper with in the MCMUA's "all-in-one" single-stream recycling collection program, the shredded paper must be put into a translucent or clear plastic bag and the bag must be tied closed. (Recycling - Single-Stream - All-In-One) Empty, rinse and commingle with recyclables. Aerosol cans must be empty. Remove plastic cap/lids, and put them into the garbage. (Recycling - Single-Stream - All-In-One) Also include paperback or softcover books. Do not include hardcover books.